To Peninsula Orthodontic Group Inc.! Thank you for visiting the website of Peninsula Orthodontic Group Inc., a respected orthodontic care provider conveniently located in Redwood City, California. Our mission is to enhance the quality of life of our patients by creating beautiful, attractive smiles with balanced, beautiful faces that radiate confidence and self-esteem. We pride ourselves on being prompt, professional, honest and thorough. We strive to gain the trust and respect of each patient, and we always welcome comments that help us grow to exceed your expectations! 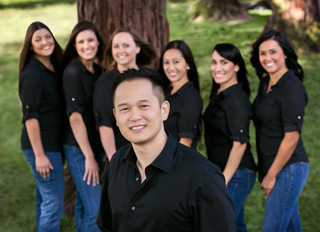 Dr. James Tsau (aka "Dr. James") and his well-trained, friendly team at Peninsula Orthodontic Group, Inc. are dedicated to providing an unsurpassed level of personal service in an environment of trust and integrity. We love working with children and provide exceptional early orthodontic treatment to correct any upcoming problems. Adult orthodontic treatment will not only result in an attractive smile, but it can also correctly align teeth to provide ideal jaw function. We appreciate you visiting our website. If you have any questions about our practice, please contact us. We'll be glad to assist you in any way we can!